Stray Kids's 'Uniformz' talk about being handsome, sports, & more in a 'Stanning Guide' interview! 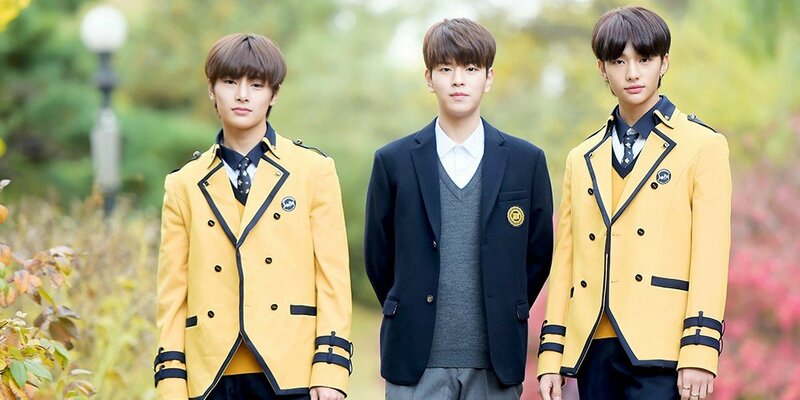 The end of 2018 marks a special time for Stray Kids's 'Uniformz' line, as two out of three Uniformz members will be graduating high school very soon! So before Stray Kids's Uniformz line goes down to just one member, current high school students Seungmin, Hyunjin, and I.N held a unique 'Stanning Guide' interview with media outlet Xsports News! Find out what Stray Kids's Uniformz had to talk about in Part 1 of their interview, below! Q: When did you first learn that you were handsome? I.N: "I didn't think I was handsome before I debuted, when I was in middle school, but now when I see that my photos turn out well from time to time, I do feel that I'm a little bit handsome." Seungmin: "A few days ago I went to the convenience store alone, and the owner ahjumma told me that I was handsome, how can my face be so small... (laughter). But I don't think I'm handsome! I think Lee Know hyung and Felix are..."
Hyunjin: "I learned when people around me told me. I used to go to an all-boys high school, and my friends would tell me that I was handsome." Seungmin: "When guys tell you that, it's true." I.N: "I've never had a sport I've been good at in my life. In my school days, the 'sport' I received the best marks in was youth gymnastics. I had really good marks. Otherwise, I'm terrible at sports... but I do want to try archery!" Hyunjin: "I like sports, so I played various sports when I was young. I did skiing and water skiing, tennis, and badminton. I've tried most sports, and I like playing. I've done swimming competitions too." Seungmin: "I played baseball when I was young. I was pitcher. I've played short stop too. It was just until the end of elementary school... I've tried various sports but I wasn't good at too many of them (laughter). After baseball, I was probably best at basketball. I don't think I'm good at anything using feet. I'm better at ones using hands. I want to try archery as well." I.N: "Oh, I did fight competitions when I was young! I used Muay Thai, but then I broke my shoulder... I enjoyed it a lot when I was young. I want to pick it back up." Q: What are the Stray Kids hyungs like in the eyes of Uniformz? Hyunjin: "In Stray Kids, we have mom and dad. Mom Bang Chan, and dad Woojin. There's those two hyungs, and then the troublemaking hyungs. Changbin and Lee Know, they're always causing a ruckus!" I.N: "Those slackers... they don't listen to the hyungs! And the 2000-line hyungs and I are stuck in the middle!" Seungmin: "The team is made of more dongsaengs then hyungs. The hyungs have a hard time." Hyunjin: "I would like for us to hurry and grow up, so we can help the hyungs." Seungmin: "There are many times when I feel, 'That's why he's hyung' during promotions. If I'm staring off into space, the hyungs snap me out of it." For more exclusive Xsports News photos of Stray Kids's Uniformz in uniform, visit the boys' full interview Part 1 here! Interviews Part 2 and Part 3 will be posted tomorrow! Thank you so mush for translation.